Hungary and Poland’s antidemocratic turn: a new era or more of the same? While the recent changes in Hungary and Poland are a cause for concern, they do not represent a departure from traditionally entrenched contests within these societies. Instead, the current politics of Hungary and Poland continue to replicate, and even deepen, historical political divides. Hungary and Poland have recently witnessed constitutional changes that have limited the independence of courts and the media. As these developments attract international attention, they beg the question of whether the politics of eastern Europe is being fundamentally altered, and the democratic achievements of the region reversed. My research suggests that while the recent changes in Hungary and Poland are a cause for concern, they do not represent a departure from traditionally entrenched contests within these societies. Instead, the current politics of Hungary and Poland continue to replicate, and even deepen, historical political divides. 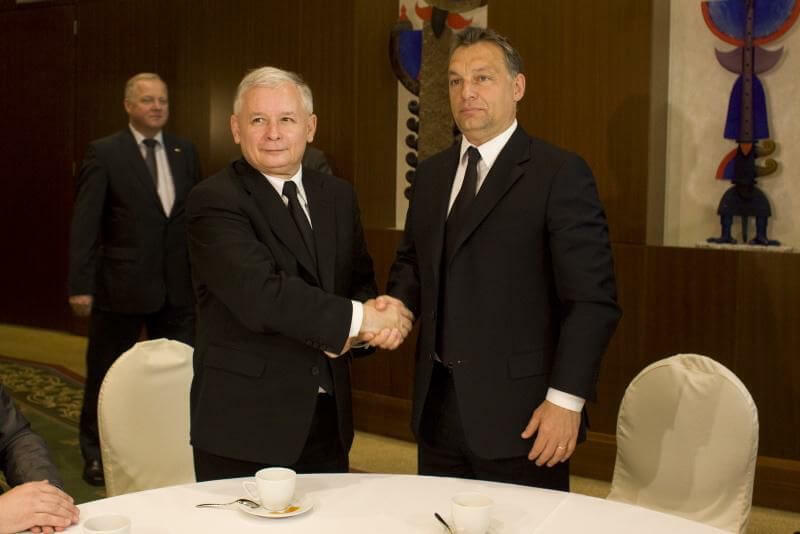 Hungary and Poland: A new era or more of the same? In a recent study, I illustrate that the main political divide in Hungary and Poland is one that combines economic preferences together with general socio-cultural visions of society. In both countries, reformed ex-communist socialist parties (MSZP in Hungary and SLD in Poland) initially coalesce with liberals around socially-liberal, pro-market policies, while deepening their countries’ cooperation with western partners, particularly the European Union. These forces are consistently opposed by traditional, conservative, nationalist, and generally protectionist opposition. The key change in both countries has been the continuous weakening of the socially-liberal pole of the main political divide, coupled with increasingly bold assertions of conservative nationalism from the opposite side. In both Hungary and Poland, this core divide has been present since the early 1990s, and remains unaltered, even as it witnesses a flux of party organisations on either side. First, the original liberal parties in both countries – that is the Union of Freedom (UW) in Poland, and the Alliance of Free Democrats (SzDSz) in Hungary – lost parliamentary representation, only to be replaced by similar socially-liberal political organisations in later elections, such as Your Movement (RP) in Poland, and Politics Can Be Different (LMP) and other minor formations in Hungary. Second, the socialist parties (MSZP in Hungary and SLD in Poland) in both countries suffered significant electoral setbacks – largely due to corruption scandals – which strengthened the conservative pole of the political divide. In Hungary the great electoral beneficiary has been the conservative nationalist Fidesz party. In Poland, the collapse of the socialists focused competition on the contest between the liberal-conservative Civic Platform (PO), which takes up the liberal pole of Polish politics, and the conservative nationalist Law and Justice (PiS). Third, in both countries minor radical nationalist parties – such as the League of Polish Families (LPR) and Self-Defense in Poland, and the Justice and Life Party (MIEP) in Hungary – have given way to electorally more powerful organisations. In the case of Poland, Law and Justice has come to represent the nationalist pole, while in Hungary, this pole is represented jointly by the radical Jobbik, and the governing Fidesz. The figure above demonstrates the extent to which the current party systems of Hungary and Poland replicate the same pattern. It plots major political parties (with a vote share over 3 per cent) based on their economic left-right, and their social conservative-liberal stances. Clearly the main divide in both countries runs over socio-cultural, rather than economic issues. 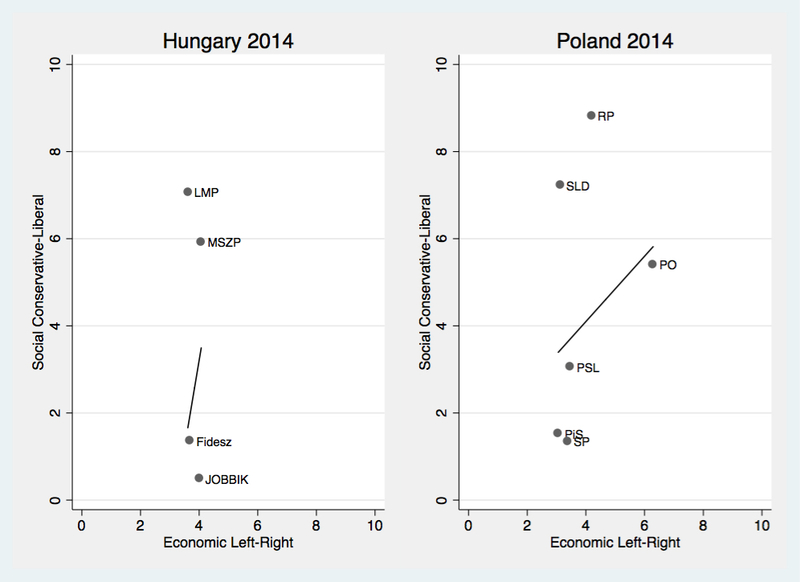 In both countries we see a cluster of socially conservative parties (Fidesz and Jobbik in Hungary, and PiS and SP in Poland), opposed by a more-less cohesive cluster of socially liberal parties that do not differ much on their economic positions. Consequently, despite a number of dramatic shifts in terms of party organisation and governing coalition options, the key divide in both Hungary and Poland remains intact. This is an important finding, further supported by ongoing research I am conducting with Jonathan Polk, as it underlines the fact that even when political parties have a weak organisational basis, as is typically the case in eastern Europe, they nonetheless tend to represent stable political divides and electorates. Although they come and go, they replicate stable patterns of political competition. What then has changed in Hungary and Poland? The key change in both countries has been the continuous weakening of the socially-liberal pole of the main political divide, coupled with increasingly bold assertions of conservative nationalism from the opposite side. Since the electoral undermining of socialist parties, the liberal bloc in Hungary contains a multiplicity of weak organisations struggling to form an effective anti-Fidesz coalition. In Poland, the liberal-conservative Civic Platform (PO) is under pressure from the conservative Law and Justice (PiS), the minor liberals, as well as from anti-system populists. Simultaneously, the politicians of the conservative pole in both countries are pursuing further goals on the liberal-conservative divide with greater confidence. Shifting away from simply championing conservative values in the current political framework, the Hungarian and, more recently Polish, governments are reformulating their political regimes by enacting legal changes deemed as limiting the independence of constitutional courts, and of the media. The Prime Minister of Hungary, Viktor Orban, whose tactics have been closely observed by the current government in Warsaw, argues for the need to “construct a new state built on illiberal and national foundations”. Finally, the conservative pole in both countries has been strengthened by the migration wave, which saw hundreds of thousands of refugees arriving in Europe from primarily Syria and Afghanistan in 2015. As many unregistered migrants passed through Hungary on their way to Germany and Scandinavia, Viktor Orban seized the political opportunity by sealing the Hungarian-Serbian border, and by vocally criticising immigration, as well as European Union plans to resettle the refugees throughout the EU. 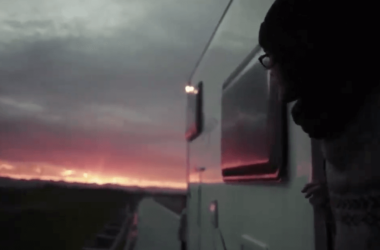 The 2015 Polish election took place in the context of this migration wave, giving the opposition Law and Justice (PiS) party the opportunity to criticise the incumbent Civic Platform (PO) for accepting EU refugee quotas. Thus, the conservatives of both countries profited from this exogenous shock by integrating the political issue of immigration – a hitherto novel issue in Hungarian and Polish politics – into the existing liberal-conservative divide, and taking a vocal position on it. Despite the increasingly anti-democratic character of the conservative political camps, the core political division in Poland and Hungary remains stable. The significant changes that have occurred in Poland and Hungary amount to worrying attempts at the hollowing out of liberal democracy, and the fueling of xenophobic nationalism. These changes are, however, taking place within the historical liberal-conservative political divide which has shaped the politics of these countries over the last quarter of a century. Despite the rise of various political organisations, and despite the increasingly anti-democratic character of the conservative political camps, as well as the increased salience of immigration, the core political division in Poland and Hungary remains stable. 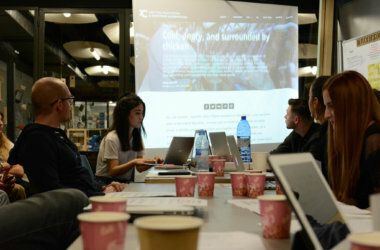 The article was first published on LSE EUROPP – Europian Politics and Policy. Jan Rovny is an Assistant Professor in Political Science at the CEE and LIEPP at Sciences Po, Paris, and at CERGU at the University of Gothenburg. His research concentrates on political competition in Europe with the aim of uncovering the ideological conflict lines in different countries. He is also one of the principal investigators of the Chapel Hill Expert Survey. He has published in World Politics, Party Politics, European Union Politics, European Political Science Review, East European Politics and Societies and elsewhere.